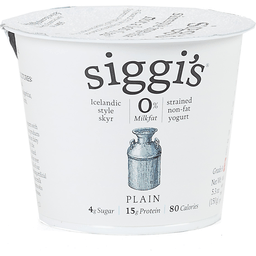 Siggi's® Strained Non-Fat Yogurt Plain. Icelandic style skyr. 0% Milkfat. 3g Sugar. 17g Protein. 100 Calories. Grade A. Net Wt. 5.3 oz (150 g). At Siggi's, we make yogurts with simple, natural ingredients. Our products are based on Scandinavian Dairy traditions, such as skyr, the the traditional Icelandic yogurt. Also, our products don't contain any of those dreadful artificial sweeteners. We only use milk from farmers who do not use growth hormones like rBst. I hope you enjoy. All natural milk from grass-fed cows. No aspartame. No sucralose. No gelatin. No artificial colorings. No preservatives. No high fructose corn syrup. Milk produced without the use of rBST. Certified Gluten-Free®. www.siggisdairy.com.